Teachers of any kind should be excellent listeners. You’re definitely the one in charge, but it’s important to keep your students’ needs at the forefront of your mind. Remember: Your job is to help your students get the most out of martial arts they can. Listening to their wants as well as their needs can help you accomplish that. If your students are asking a lot of questions about a particular subject, that should be an indicator that you probably need to spend more time on it. In the same vein, if any of your students are complaining about being a little tired one day, consider slowing the pace of the class and including a few more water breaks than usual. Practicing martial arts should be fun, so do your best to make studio time as enjoyable as possible. This goes hand in hand with the first tip. Once you understand what adjustments need to be made, be flexible enough to incorporate them in your instruction methods. To be effective in accomplishing that, adjust your sessions to accommodate individuals in your class. If you’re teaching a martial arts class to the elderly, it’s probably a good idea to keep the high-impact movements to a minimum. 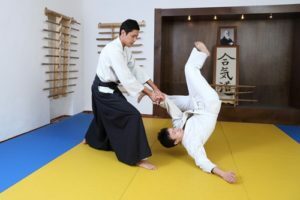 Instead, focus on other aspects of practicing martial arts, like breathing and flexibility. If you’re teaching younger children, chances are their attention span won’t be very long. Keep that in mind when planning your classes, and do your best not to include anything in the curriculum that your younger students won’t fully grasp. Good organization goes a long way in helping you make the most of your time in the studio. Establish a game plan before class starts so you don’t have to waste any precious time thinking about what to do next. It’s a good idea to add some variety to your classes, too. Doing so will increase your students’ overall knowledge of the sport and may provide an even healthier form of exercise. You should be doing everything you can to motivate students to pick a class schedule and stick to it. Not only will it help them master their martial art of choice, but it will also keep your studio in business! Additionally, try to get students to practice martial arts outside the studio. Although you can’t be responsible for all the motivation it takes for your students to practice, you can do your part to encourage it. Think about assigning students a task at the end of one session and quiz them on it at the beginning of the next one. Luckily, most martial arts already have a reward system in place through rank promotions. Karate, for example, rewards students through belt color graduations. You will most likely be a major part of the ceremony, but go the extra step by reinforcing your students’ accomplishments on a separate occasion. Consider making announcements in class or sending out a newsletter to congratulate students who have recently advanced in rank.